Area: 48,442 sq. km. (18,704 sq. mi. ), about the size of Vermont and New Hampshire combined. Cities: Capital--Santo Domingo (pop. 2.7 million). Other city--Santiago de los Caballeros (908,230). Annual growth rate (2005): 7.5%. Ethnic groups: European 16%, African origin 11%, mixed 73%. Education: Years compulsory--6 Attendance--70%. Literacy--84.7%. Health: Infant mortality rate: 28.3/1,000. Life expectancy--70.2 years for men, 73.3 years for women. Work force: 60.2% services (tourism, transportation, communications, finances, others), 15.5% industry (manufacturing), 11.5% construction, 11.3% agriculture, 1.5% mining. Independence: February 27, 1844. Restoration of independence, August 16, 1863. Constitution: November 28, 1966; amended July 25, 2002. Branches: Executive--president (chief of state and head of government), vice president, cabinet. Legislative--bicameral Congress (Senate and House of Representatives). Judicial--Supreme Court of Justice. Subdivisions: 31 provinces and the National District of Santo Domingo. Political parties: Social Christian Reformist Party (PRSC), Dominican Revolutionary Party (PRD), Dominican Liberation Party (PLD), and several others. Suffrage: Universal and compulsory, over 18 or married. Non-fuel minerals (1% of GDP): Nickel, gold, silver. Agriculture (12% of GDP): Products--sugarcane, coffee, cocoa, bananas, tobacco, rice, plantains, beef. Industry (24% of GDP): Types--sugar refining, pharmaceuticals, cement, light manufacturing, construction. Services, including tourism and transportation: 61% of GDP. Trade: Exports ($5.8 billion (FOB), including processing zones: textiles, sugar, coffee, ferronickel, cacao, tobacco, meats and medical supplies. Markets--U.S. (80%), Canada, western Europe, South Korea. Imports--$8.9 billion: food stuffs, petroleum, industrial raw materials, capital goods. Suppliers--U.S. (48%), Japan, Germany, Venezuela, Mexico, Colombia. About half of Dominicans live in rural areas; many are small landholders. Haitians form the largest foreign minority group. All religions are tolerated; the state religion is Roman Catholicism. The island of Hispaniola, of which the Dominican Republic forms the eastern two-thirds and Haiti the remainder, was originally occupied by Tainos, an Arawak-speaking people. The Tainos welcomed Columbus in his first voyage in 1492, but subsequent colonizers were brutal, reducing the Taino population from about 1 million to about 500 in 50 years. To ensure adequate labor for plantations, the Spanish brought African slaves to the island beginning in 1503. In the next century, French settlers occupied the western end of the island, which Spain ceded to France in 1697, and which, in 1804, became the Republic of Haiti. The Haitians conquered the whole island in 1822 and held it until 1844, when forces led by Juan Pablo Duarte, the hero of Dominican independence, drove them out and established the Dominican Republic as an independent state. In 1861, the Dominicans voluntarily returned to the Spanish Empire; in 1865, independence was restored. Economic difficulties, the threat of European intervention, and ongoing internal disorders led to a U.S. occupation in 1916 and the establishment of a military government in the Dominican Republic. The occupation ended in 1924, with a democratically elected Dominican Government. In 1930, Rafael L. Trujillo, a prominent army commander, established absolute political control. Trujillo promoted economic development--from which he and his supporters benefited--and severe repression of domestic human rights. Mismanagement and corruption resulted in major economic problems. In August 1960, the Organization of American States (OAS) imposed diplomatic sanctions against the Dominican Republic as a result of Trujillo's complicity in an attempt to assassinate President Romulo Betancourt of Venezuela. These sanctions remained in force after Trujillo's death by assassination in May 1961. In November 1961, the Trujillo family was forced into exile. In January 1962, a council of state that included moderate opposition elements with legislative and executive powers was formed. OAS sanctions were lifted January 4, and, after the resignation of President Joaquin Balaguer on January 16, the council under President Rafael E. Bonnelly headed the Dominican government. In 1963, Juan Bosch was inaugurated President. Bosch was overthrown in a military coup in September 1963. Another military coup, on April 24, 1965, led to violence between military elements favoring the return to government by Bosch and those who proposed a military junta committed to early general elections. On April 28, U.S. military forces landed to protect U.S. citizens and to evacuate U.S. and other foreign nationals. Additional U.S. forces subsequently established order. In June 1966, President Balaguer, leader of the Reformist Party (now called the Social Christian Reformist Party--PRSC), was elected and then re-elected to office in May 1970 and May 1974, both times after the major opposition parties withdrew late in the campaign. In the May 1978 election, Balaguer was defeated in his bid for a fourth successive term by Antonio Guzman of the Dominican Revolutionary Party (PRD). Guzman's inauguration on August 16 marked the country's first peaceful transfer of power from one freely elected president to another. The PRD's presidential candidate, Salvador Jorge Blanco, won the 1982 elections, and the PRD gained a majority in both houses of Congress. In an attempt to cure the ailing economy, the Jorge administration began to implement economic adjustment and recovery policies, including an austerity program in cooperation with the International Monetary Fund (IMF). In April 1984, rising prices of basic foodstuffs and uncertainty about austerity measures led to riots. Balaguer was returned to the presidency with electoral victories in 1986 and 1990. Upon taking office in 1986, Balaguer tried to reactivate the economy through a public works construction program. Nonetheless, by 1988 the country had slid into a 2-year economic depression, characterized by high inflation and currency devaluation. Economic difficulties, coupled with problems in the delivery of basic services--e.g., electricity, water, transportation--generated popular discontent that resulted in frequent protests, occasionally violent, including a paralyzing nationwide strike in June 1989. In 1990, Balaguer instituted a second set of economic reforms. After concluding an IMF agreement, balancing the budget, and curtailing inflation, the Dominican Republic experienced a period of economic growth marked by moderate inflation, a balance in external accounts, and a steadily increasing GDP that lasted through 2000. The voting process in 1986 and 1990 was generally seen as fair, but allegations of electoral board fraud tainted both victories. The elections of 1994 were again marred by charges of fraud. Following a compromise calling for constitutional and electoral reform, President Balaguer assumed office for an abbreviated term and Congress amended the Constitution to bar presidential succession. In June 1996, Leonel Fern�ndez Reyna of the Dominican Liberation Party (PLD) was elected to a 4-year term as president. Fern�ndez's political agenda was one of economic and judicial reform. He helped enhance Dominican participation in hemispheric affairs, such as the OAS and the follow up to the Miami Summit. On May 16, 2000, Hip�lito Mej�a, the PRD candidate, was elected president in another free and fair election, soundly defeating PLD candidate Danilo Medina and Former President Balaguer. Mej�a championed the cause of free trade and Central American and Caribbean economic integration. The Dominican Republic signed a free trade agreement with the United States and five Central American countries (DR-CAFTA) in August 2004, in the last weeks of the Mej�a administration. During the Mej�a administration, the government sponsored and obtained anti-trafficking and anti-money-laundering legislation, sent troops to Iraq in support of the fight against terrorism, and ratified the Article 98 agreement it had signed in 2002. Mej�a faced mounting domestic problems as a deteriorating economy--caused in large part by the government�s measures to deal with massive bank fraud--and constant power shortages plagued the latter part of his administration. During the Mej�a administration, the Constitution was amended to permit an incumbent president to seek a second successive term, and Mej�a ran for re-election. On May 16, 2004, Leonel Fern�ndez was elected president in a free and fair election, defeating Mej�a 57.11% to 33.65%. Eduardo Estrella of the PRSC received 8.65% of the vote. Fern�ndez took office on August 16, 2004, promising in his inaugural speech to promote fiscal austerity, to fight corruption and to support social concerns. Fern�ndez said the Dominican Republic would support policies favoring international peace and security through multilateral mechanisms in conformity with the United Nations and the OAS. The Fern�ndez administration has worked closely with the United States on law enforcement and immigration and counter-terrorism matters. On May 16, 2006, President Fern�ndez�s PLD won a majority of seats in the upper and lower houses of Congress as well as a plurality of mayoral seats, marking a major shift in power among the main political parties. 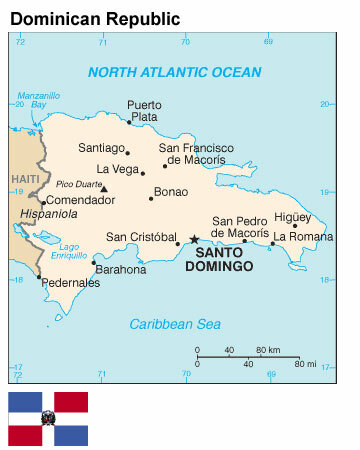 The Dominican Republic is a representative democracy with national powers divided among independent executive, legislative, and judicial branches. The president appoints the cabinet, executes laws passed by the legislative branch, and is commander in chief of the armed forces. The president and vice president run for office on the same ticket and are elected by direct vote for 4-year terms. Legislative power is exercised by a bicameral congress--the Senate (32 members), and the House of Representatives (150 members). The Dominican Republic has a multi-party political system with national elections every 2 years (alternating between presidential elections and congressional/municipal elections). Presidential elections are held in years evenly divisible by four. Congressional and municipal elections are held in even numbered years not divisible by four. International observers have generally agreed that presidential and congressional elections since 1996 have been free and fair. Elections are supervised by a Central Elections Board of 9 members chosen for a four-year term by the newly elected Senate. Its decisions on electoral matters are final. Under the constitutional reforms negotiated after the 1994 elections, the 16-member Supreme Court of Justice is appointed by a National Judicial Council, which is comprised of the President, the leaders of both houses of Congress, the President of the Supreme Court, and an opposition or non-governing-party member (one other Supreme Court Justice acts as secretary of the Council, a non-voting position.) The Supreme Court has sole jurisdiction over managing the court system and over actions against the president, designated members of his cabinet, and members of Congress. The Supreme Court hears appeals from lower courts and chooses members of lower courts. Each of the 31 provinces is headed by a presidentially appointed governor. Mayors and municipal councils to administer the National District (Santo Domingo) and the 124 municipal districts are elected at the same time as congressional representatives. The Dominican Republic maintains an embassy in the United States at 1715 22d Street NW, Washington, DC 20008 (tel. 202-332-6280). Congress authorizes a combined military force of 44,000 active duty personnel. Actual active duty strength is approximately 32,000. However, approximately 50% of those are used for non-military activities such as security providers for government-owned non-military facilities, highway toll stations, prisons, forestry work, state enterprises, and private businesses. The Commander in Chief of the military is the President. The principal missions are to defend the nation and protect the territorial integrity of the country. The army, larger than the other services combined with approximately 20,000 active duty personnel, consists of six infantry brigades, a combat support brigade, and a combat service support brigade. The air force operates two main bases, one in the southern region near Santo Domingo and one in the northern region near Puerto Plata. The navy operates two major naval bases, one in Santo Domingo and one in Las Calderas on the southwestern coast, and maintains 12 operational vessels. In the Caribbean, only Cuba has a larger military force. The armed forces have organized a Specialized Airport Security Corps (CESA) and a Specialized Port Security Corps (CESEP) to meet international security needs in these areas. The Secretary of the Armed Forces has also announced plans to form a specialized border corps (CESEF). Additionally, the armed forces provide 75% of personnel to the National Investigations Directorate (DNI) and the Counter-Drug Directorate (DNCD). The Dominican National Police force contains 32,000 agents. The police are not part of the Dominican armed forces, but share some overlapping security functions. Sixty-three percent of the force serve in areas outside traditional police functions, similar to their military counterparts. The Dominican Republic had one of the fast growing economies in the world in the 1990s. After a decade of little to no growth in the 1980s, the Dominican Republic�s economy boomed, expanding at an average rate of 7.7% per year from 1996 to 2000. Tourism (the leading foreign exchange earner), telecommunications, and free-trade-zone manufacturing are increasingly important industries, although agriculture is still a major part of the economy. The Dominican Republic owed much of its success to the adoption of sound macroeconomic policies in the early 1990s and greater opening to foreign investment. Growth turned negative in 2003 (-0.4%) due to the effects of government handling of major bank frauds and to lower U.S. demand for Dominican manufacturers. The Mej�a administration negotiated an IMF standby agreement in August 2003 but was unable to comply with fiscal targets. The Fern�ndez administration obtained required tax legislation and IMF board approval for the standby in January 2005. The Dominican peso fell to an unprecedented low in exchange markets in 2003-2004 but strengthened dramatically following the election and inauguration of Leonel Fern�ndez. Since late 2004 it has traded at a rate considered to be overvalued on a purchasing power parity basis. Inflation was cut sharply in late 2004 and was estimated at 9% for that calendar year. The new administration successfully renegotiated official bilateral debt with Paris Club member governments, commercial bank debt with London Club members, and sovereign debt with a consortium of lenders. It met fiscal and financial targets of the standby agreement but fell short of goals for reforms in the electricity sector and financial markets. Central Bank statistics indicate 7.5% estimated growth for 2005 with 9% inflation. The Dominican Republic�s most important trading partner is the United States (87% of export revenues); other markets include Canada, Western Europe, and Japan. The country exports free-trade-zone manufactured products (garments, footwear, etc. ), nickel, sugar, coffee, cacao, and tobacco, and it imports foodstuffs, petroleum, industrial raw materials, and capital goods. On September 5, 2005, the Dominican Congress ratified a Free Trade Agreement with the U.S. and five Central American countries, known as CAFTA-DR. The stock of U.S. foreign direct investment (FDI) in the country in 2004 was $1.0 billion, up from $816 million in 2003, much of it directed to the tourism sector, to free trade zones, and to the telecommunications sector. Remittances were close to $3 billion in 2004. An ongoing concern is the inability of participants in the electricity sector to establish financial viability for the system. Three national electricity distribution systems were privatized in 1998 via sale of 50% of shares to foreign operators; the Mej�a administration repurchased all foreign-owned shares in two of these systems in late 2003. The third, serving the eastern provinces, is owned and operated by U.S. concerns. About half of electricity billed goes unpaid, and distributors have made very slow progress in improving collections. Debts in the sector, including government debt, amount to more than U.S. $500 million, and generating companies are undercapitalized and at times unable to purchase adequate fuel supplies. The Dominican Republic has a close relationship with the United States and with the other states of the inter-American system. It has accredited diplomatic missions in most Western Hemisphere countries and in principal European capitals. Newly elected president of Haiti Ren� Pr�val made a working visit to Santo Domingo in March 2006, reciprocating Leonel Fern�ndez�s call on the Interim Government of Haiti in December 2005. The Dominican government has regularly appealed for international support for its island neighbor. There is a sizeable Haitian migrant community in the Dominican Republic, many of whom lack residence permits and citizenship documentation. The Dominican Republic belongs to the UN and many of its specialized and related agencies, including the World Bank, International Labor Organization, International Atomic Energy Agency, and International Civil Aviation Organization. It is a member of the OAS and the Inter-American Development Bank. The U.S. has a strong interest in a democratic, stable, and economically healthy Dominican Republic. The country�s standing as the largest Caribbean economy, second-largest country in terms of population and land mass, with large bilateral trade with the United States, and its proximity to the United States and other smaller Caribbean nations make the Dominican Republic an important partner in hemispheric affairs. The Embassy estimates that 60,000 U.S. citizens live in the Dominican Republic; many are dual nationals. An important element of the relationship between the two countries is the fact that more than 1 million individuals of Dominican origin reside in the United States, most of them in the metropolitan Northeast and some in Florida. U.S. relations with the Dominican Republic are excellent, and the U.S. has been an outspoken supporter of that country's democratic and economic development. The Dominican government has been supportive of many U.S. initiatives in the United Nations and related agencies. The two governments cooperate in the fight against the traffic in illegal substances. The Dominican Republic has worked closely with U.S. law enforcement officials on issues such as the extradition of fugitives and measures to hinder illegal migration. The United States supports the Fern�ndez administration's efforts to improve Dominican competitiveness, increase foreign private investment, fight corruption, and modernize the tax system. Bilateral trade is important to both countries, and U.S. firms, mostly manufacturers of apparel, footwear, and light electronics, account for much of the foreign private investment in the Dominican Republic. Exports from the United States, including those from Puerto Rico and the U.S. Virgin Islands, to the Dominican Republic in 2005 totaled $9.6 billion. The Dominican Republic exported $6.1 million to the United States in 2005, equaling some 77% of its export revenues. The U.S. Embassy works closely with U.S. business firms and Dominican trade groups, both of which can take advantage of the new opportunities in this growing market. At the same time the Embassy is working with the Dominican government to resolve business disputes from previous administrations. The Embassy counsels U.S. firms through its written Country Commercial Guide and informally via meetings with business persons planning to invest or already investing in the Dominican Republic. It is a challenging business environment for U.S. firms, although agile exporters and investors can profit doing business in the Dominican Republic. The U.S. Agency for International Development (USAID) mission is focused on four areas: availability of health care, increasing economic opportunity, improving participation in democratic processes, and environmentally sound energy production. The U.S. Embassy is located at Calle C�sar Nicolas Penson and Calle Leopoldo Navarro, Santo Domingo (tel. 809-221-2171). The U.S. Department of State's Consular Information Program provides Consular Information Sheets, Travel Warnings, and Public Announcements. Consular Information Sheets exist for all countries and include information on entry requirements, currency regulations, health conditions, areas of instability, crime and security, political disturbances, and the addresses of the U.S. posts in the country. Travel Warnings are issued when the State Department recommends that Americans avoid travel to a certain country. Public Announcements are issued as a means to disseminate information quickly about terrorist threats and other relatively short-term conditions overseas that pose significant risks to the security of American travelers. Free copies of this information are available by calling the Bureau of Consular Affairs at 202-647-5225 or via the fax-on-demand system: 202-647-3000. Consular Information Sheets and Travel Warnings also are available on the Consular Affairs Internet home page: http://travel.state.gov/. Consular Affairs Tips for Travelers publication series, which contain information on obtaining passports and planning a safe trip abroad, are available on the Internet and hard copies can be purchased from the Superintendent of Documents, U.S. Government Printing Office, telephone: 202-512-1800; fax 202-512-2250. The National Passport Information Center (NPIC) is the U.S. Department of State's single, centralized public contact center for U.S. passport information. Telephone: 1-877-4USA-PPT (1-877-487-2778). Customer service representatives and operators for TDD/TTY are available Monday-Friday, 8:00 a.m. to 8:00 p.m., Eastern Time, excluding federal holidays. U.S. citizens who are long-term visitors or traveling in dangerous areas are encouraged to register their travel via the State Department's travel registration web site at https://travelregistration.state.gov/ or at the Consular section of the U.S. embassy upon arrival in a country by filling out a short form and sending in a copy of their passports. This may help family members contact you in case of an emergency. Department of State Web Site. Available on the Internet at http://www.state.gov/, the Department of State web site provides timely, global access to official U.S. foreign policy information, including Background Notes and daily press briefings along with the directory of key officers of Foreign Service posts and more. Export.gov provides a portal to all export-related assistance and market information offered by the federal government and provides trade leads, free export counseling, help with the export process, and more. STAT-USA/Internet, a service of the U.S. Department of Commerce, provides authoritative economic, business, and international trade information from the Federal government. The site includes current and historical trade-related releases, international market research, trade opportunities, and country analysis and provides access to the National Trade Data Bank.